The excitement was brewing as the team were heading to the start of the final leg of the journey along the Karkloof river. This would involve walking the section from below the Karkloof Falls to the confluence where the Karkloof meets the uMngeni River. This entire stretch traverses through the Karkloof Safari Spa property, which is an upmarket private game reserve, lodge and spa with restricted access. This day was set to be a little different from the rest, as we were missing half our team (Ndu and Ayanda), however, we were fortunate to be joined by Jenna Taylor of GroundTruth and Dr. Hans Grobler who is the specialist environmental and wildlife conservation advisor to Mr Worner (the landowner). From left: Jenna Taylor, Dr Hans Grobler and Sue Viljoen. The highlight of the day was reaching the base of the Karkloof falls (normally only seen from above) via a winding wooden boardwalk built by the Karkloof Spa. 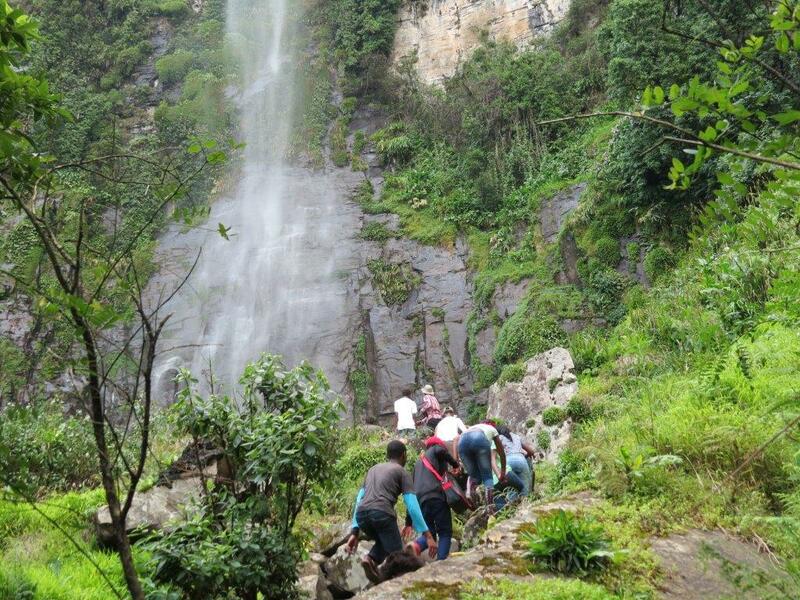 The team enjoyed the lush mistbelt forest with the many flora treasures within, expansive cliffs that tell an incredible geological story, and the damp spray of the waterfall with misty clouds rising above the falls. In this sacred place where time stands still, and one gets to just soak up the majesty and beauty of one of nature’s natural wonders, no one would guess that we were just 30 minutes from civilisation and the town of Howick. 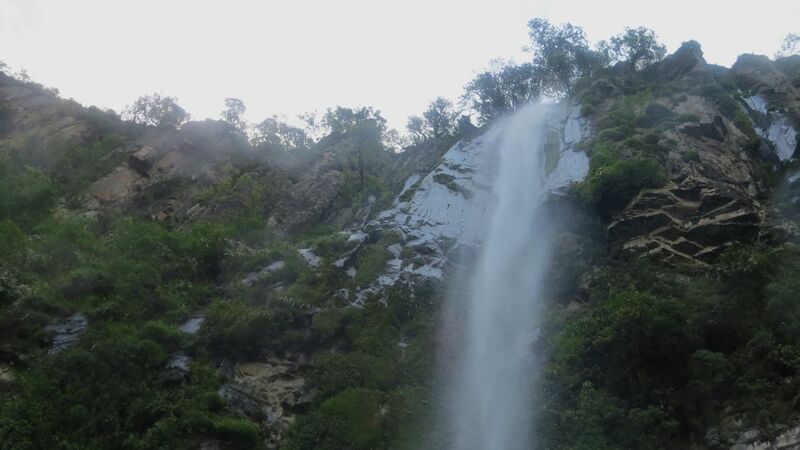 Although the team could have stayed at these magnificent falls all day, they knew they had a journey to complete. Once back out of the forested boardwalk section, the valley opened up into savannah with thorn trees and grassland, with a wealth of indigenous species tracking the river’s course through the reserve. A Buffalo stood watching us quietly from behind a large rock at the river. For at least 8km, the Karkloof’s last stretch before the confluence enjoys natural habitats all along its path, which gives the river an opportunity to heal itself of any impacts experienced higher up in the catchment. Water clarity noticeably improved as well as the levels of dissolved oxygen due to the regular riffles, rapids, and general fast flow of this section. Fast flowing river through a natural area. It is interesting to note that Lantana camara was absent along the entire stretch of river from the source to the falls, but was prolific throughout the last day’s journey. We could see that work was being done to combat this invasive alien plant, as well as many others. Dr Grobler taking the water clarity reading at the weir for us. The clarity test tube is a brilliant citizen science tool which can be purchased through GroundTruth. While taking water sample readings near the confluence, a young Spotted-necked Otter peeked its head out of the water with curiosity to see what we were doing. Spotted-necked Otters require clean, good quality water with clear visibility in order to catch fish. It was an encouraging sign to have this sighting at the end of our journey and certainly a highlight for the team. The team were amused to see that hippo also rely on the Karkloof River as home. Have you ever seen a hippo in a natural flowing river in the KZN midlands? A rare sight indeed. We were also treated to sightings of Eland, Giraffe, Zebra, Bushbuck, Warthog and many more game species. 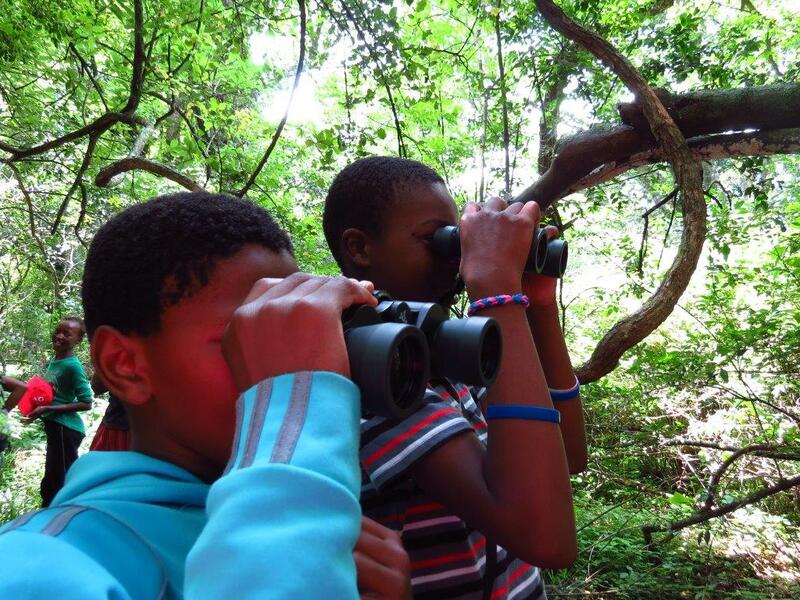 The river walkers were indeed extremely privileged to have experienced the wildlife and scenery at the Karkloof Safari Spa and are very grateful for being afforded access in order to complete the journey and collect the necessary data along the full stretch of the river. Very soon after the confluence where the Karkloof river joins onto the uMngeni, we could see the quick deterioration of water quality and the first signs of invasive water weeds on the uMngeni river at Morton’s Drift. 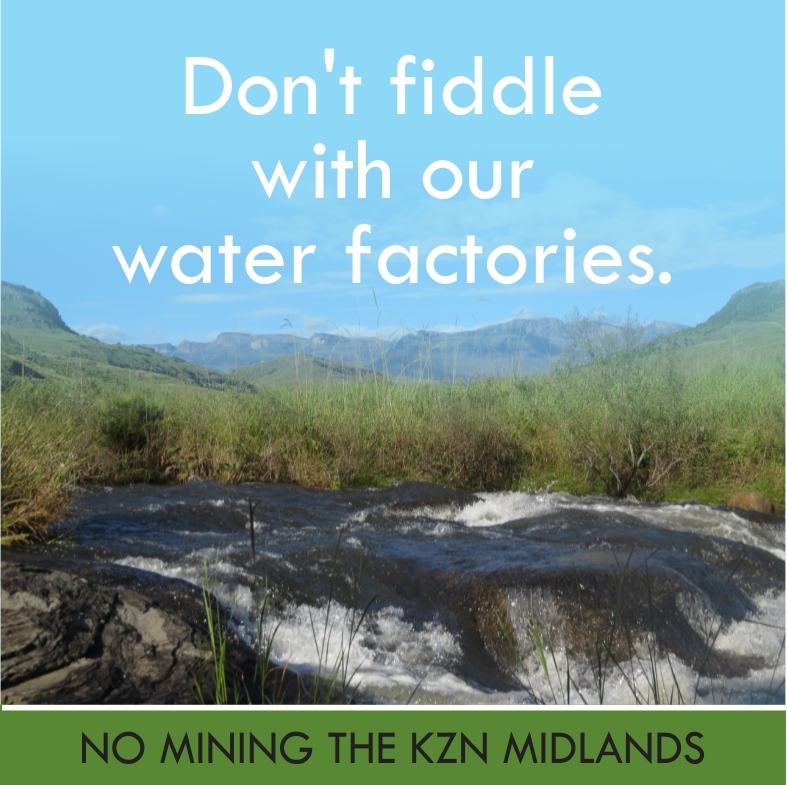 Fortunately the Karkloof River is free of aquatic invasive weeds, and will hopefully remain that way. Mortons Drift. Just below the confluence on the uMngeni River. The team celebrated the end of the 6 day Karkloof River walk from Catchment to Confluence with sundowners at the top of the Karkloof Falls at the Sappi picnic site, joined by members of the Karkloof Conservancy and WWF staff. A toast was made to the river walk accomplishment and conquering the 64km journey through hill and vale, rain and shine. Cheers! To a successful journey. 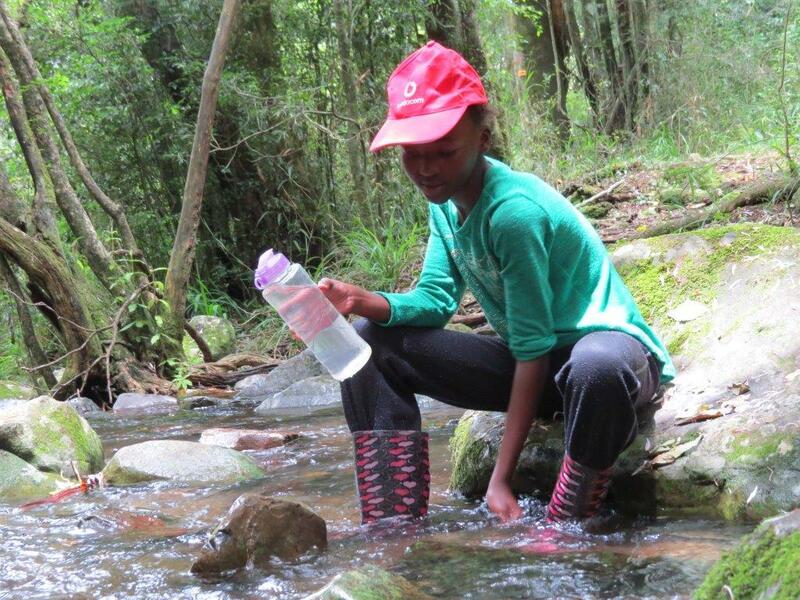 There is keen interest to see the official results of the river health sampling and the video that is being made of the C2C Karkloof River Walk journey, sponsored by Woolworths. Both of these will be shared at an upcoming Karkloof Conservancy event to be announced. A huge note of thanks to all the sponsors and partners that have contributed in both cash and kind towards this project, and to the landowners who so willingly allowed access to their properties. So which river is next? 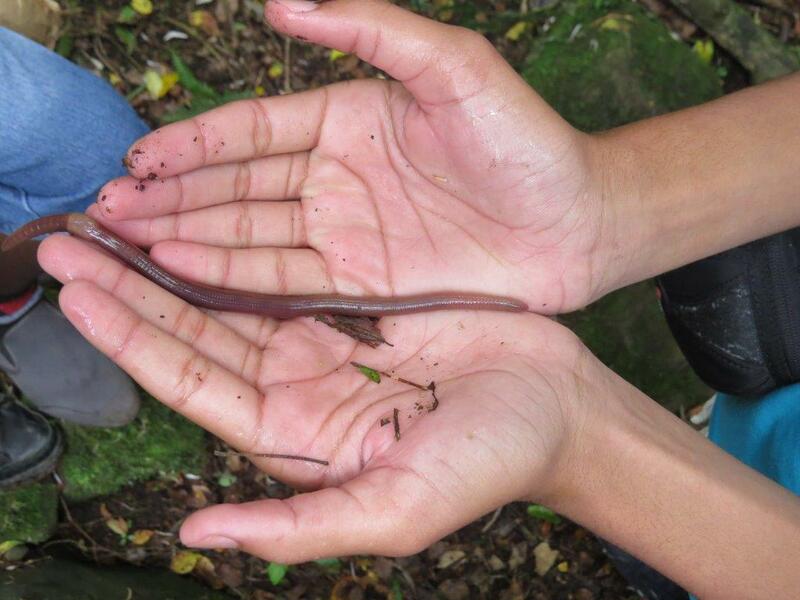 And who else is going to raise their hand to get to know the river in their own catchment? Great to see the Goble family at the end of our journey. The support from landowners has been fantastic. We look forward to sharing the results with them. From left: Ros Lindley, Fuzz Goble and his mum, Carolyn Goble. This entry was posted in Conservancy Action, Water, Water Stewardship and tagged carolyn goble, catchment to confluence, karkloof, karkloof falls, karkloof river, karkloof river walk, river, river health, river walk, spotted-necked otter, umngeni river, Water Stewardship, waterfall on May 10, 2017 by Midlands Conservancies Forum. Standing under a waterfall is always a wonderful experience. 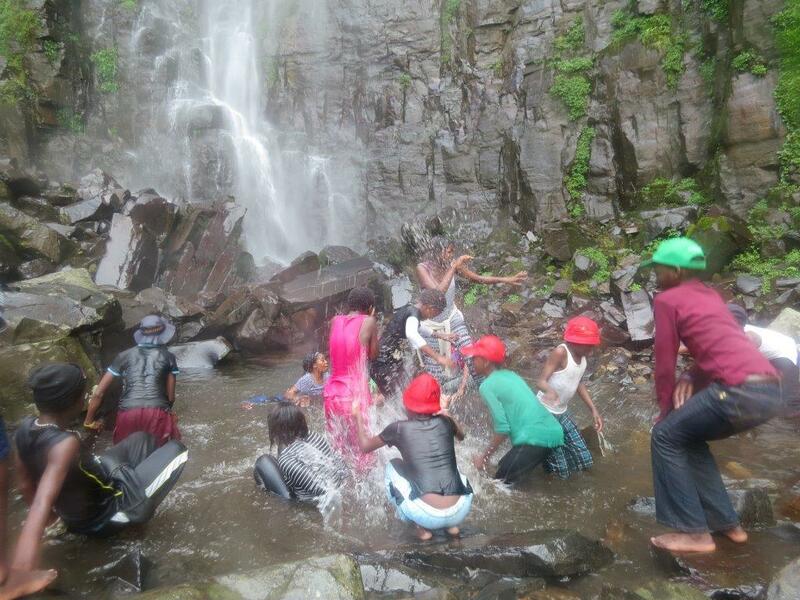 When the waterfall suddenly shifts 10metres along the cliff to include those who thought they would avoid the experience, you know it is extra special. This is the magic of Grey Mare’s Tail Falls in Karkloof. From the grasslands above, the stream plunges 101 m over the dolerite cliffs into the mist belt forest. It gets its name from the swishing action – the falls move constantly from one side to the other – just like the tail of a horse. For the 40 learners who spent a few days at Shawswood education centre last week, the 3 hour climb to Grey Mare’s Tail Falls was worth the effort. “I’m dying” puffed Nomfundo Mlotshwa when the falls were just visible through a gap in the canopy. She trudged on along the path through the forest, climbing a wooden ladder, crossing streams and rock hopping. Soaking wet after splashing in the pool, all tiredness forgotten, she beamed “This is wonderful!”. 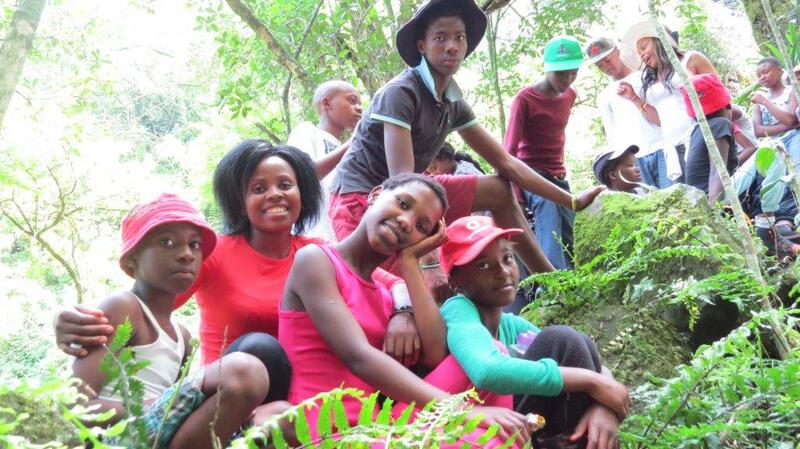 This excursion was part of the MCF Environmental Learning and Leadership (EL&L) project that organises wilderness experiences for young people, believing that in order to value and protect something you need to have experienced it. Time spent in natural environments is often life changing and certainly instils an appreciation of nature. MCF EL&L is funded by N3TC. 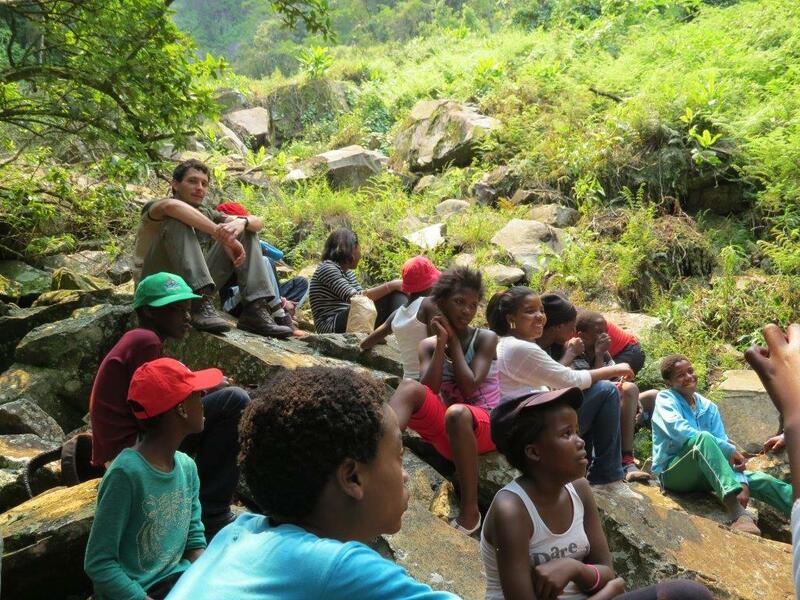 In collaboration with the MMAEP, the Zenzane Enviro Club from Balgowan and the Mpophomeni Enviro Club were invited to make new friends, learn new things and taste clean, cold, fresh water straight from the stream. The morning began with introductions beneath the cliffs. 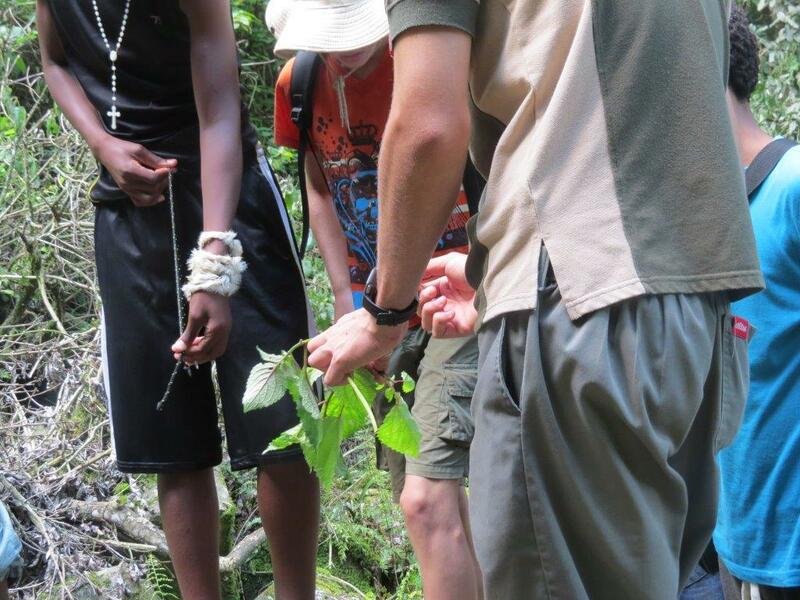 MCF has found that bringing different groups together stimulates learning and sharing. Knowing that there are people in other parts of the Midlands as passionate about environmental issues as you are creates bonds that last for a long time. Then water bottles and lunch bags in hand, we set off on a hike. Through the surrounding homesteads, greeting cows with new born claves and crossing a stream into the plantations. 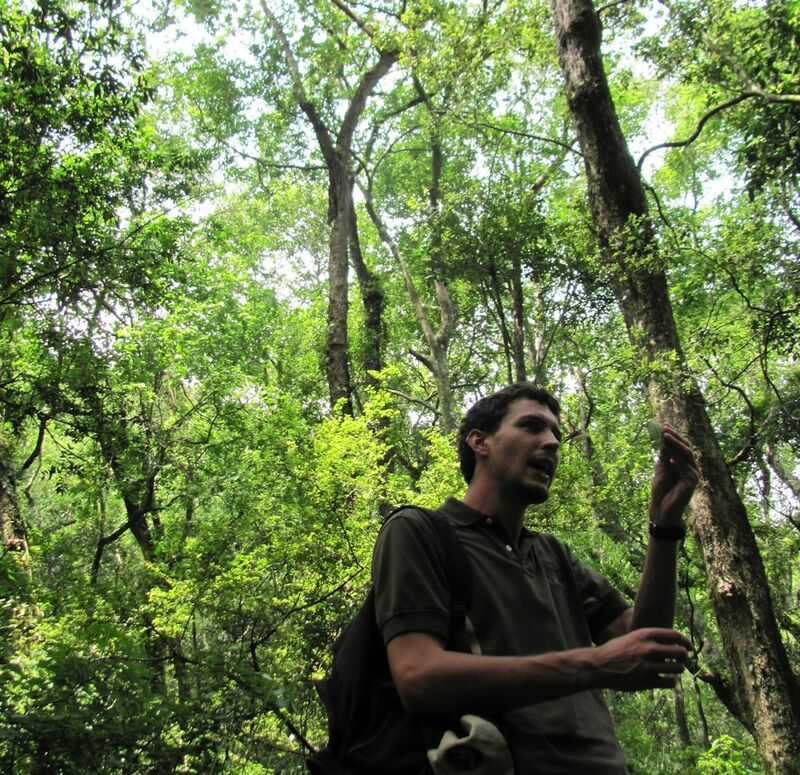 Michael Keefer, education officer for Shawswood, pointed out the impoverished habitat, the low diversity of plants and animals and explained the differences between forest and plantations. The difference was clear to Sihle Ngcobo: “There are fewer types of trees in the plantation and bigger spaces between the trees. 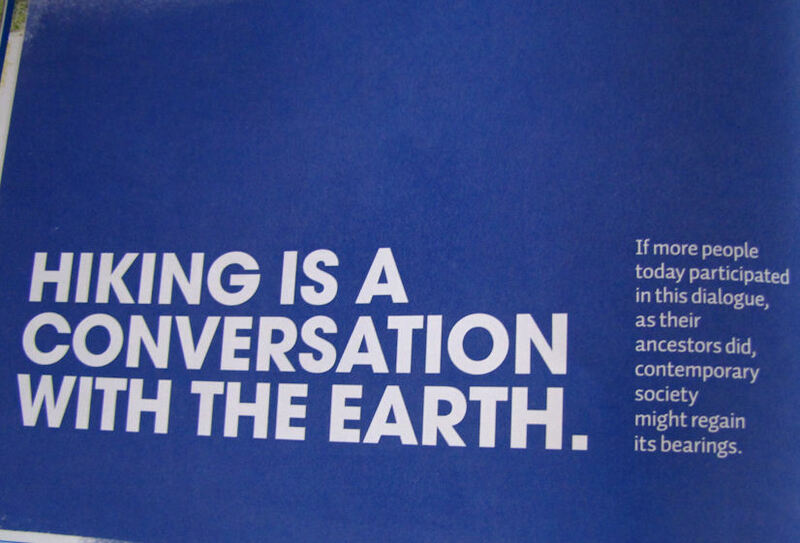 In the forest there are more worms and insects, there is not much sunlight and it is cooler.” he said. Once inside the forest, the air cooled and the biodiversity increased. The temperature in a forest is pretty much the same whatever the season. We observed the layers of plants, some with big leaves to absorb more light, others climbing through the canopy to get some sunshine, saplings simply waiting for a big tree to fall over and create a gap to let in light for them to grow. Philani Ngcobo was fascinated by the tall stems of uMsenge, the Cabbage tree reaching for the sunlight. “It was interesting that when the trees fall down, the insects go into them and help the tree to decompose.” he commented. We heard Samango monkeys but could not spot them. 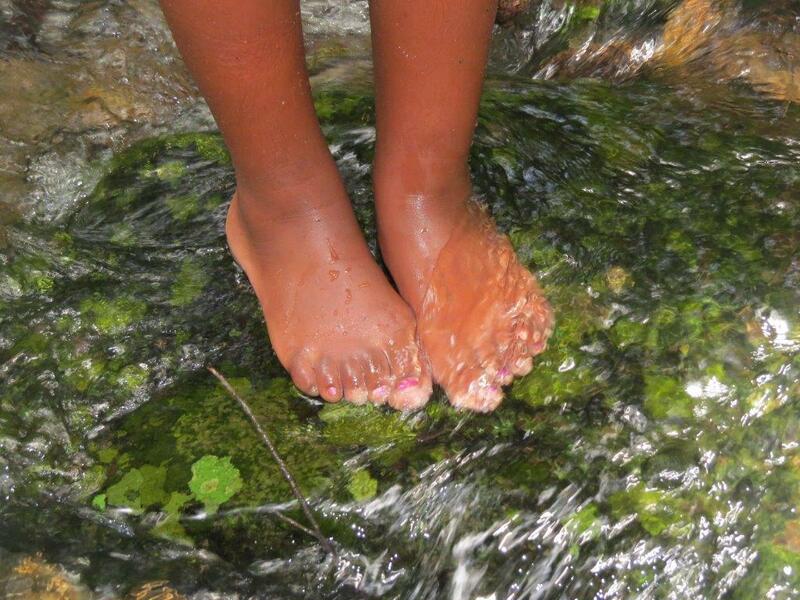 A gurgling stream provided a refreshing stop to drink from the river, fill our water bottles and have a snack. 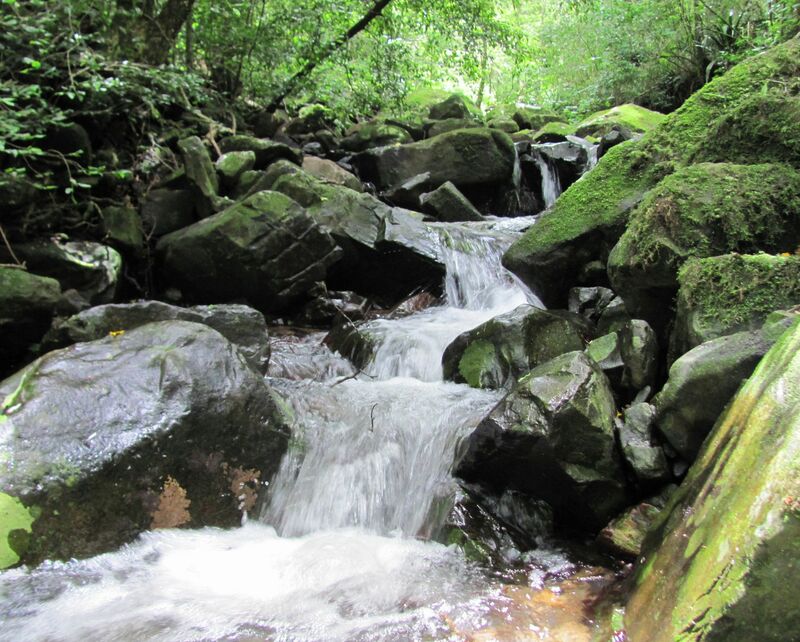 This stream is a tributary of the Karkloof River which flows into the uMngeni River. 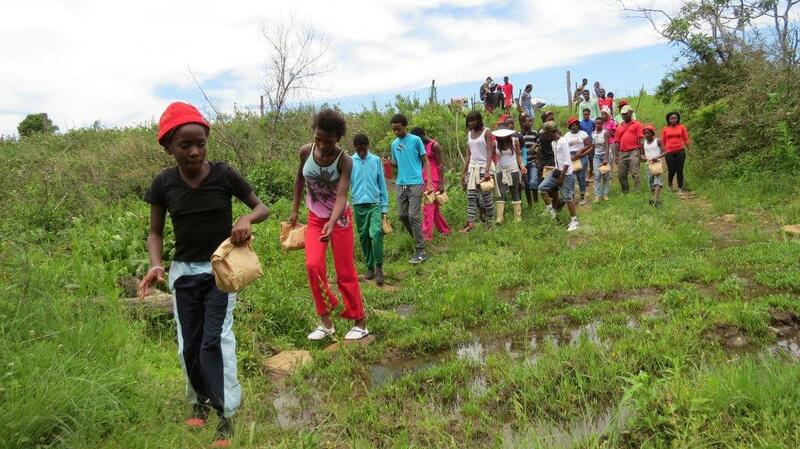 The group from Mpophomeni commented that the uMthinzima Stream through the township was also a tributary of the uMngeni. The trail mostly follows the old logging path created by early settlers to harvest the big trees – especially Yellowwoods. We came across many hollow Lemonwoods, an Ironwood that had its bark all nibbled at the base (porcupine perhaps?) and many giant Strangler Figs. Everyone was fascinated to learn how these trees can squeeze the life out of other trees. We learnt that the cure for the forest stinging nettle that created a bumpy rash on our skins when touched, grew right beside it – a member of the Plectranthus family. Forest Magic. We caught a glimpse of the Grey Mare’s Tail Falls through the trees. “How far?” became a constant refrain. 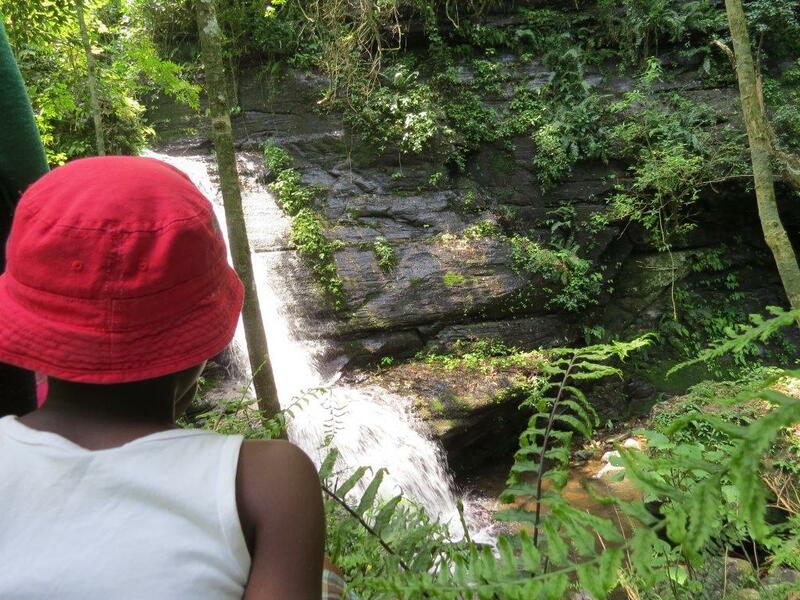 Before the final ascent to the bottom of the falls, we sat on the rocks a while to catch our breath. Surrounded by fragrant Clausena anisata, large clumps of Scadoxus clinging to the rocks and Streptocarpus tucked in the shadows. The final stretch involved clamouring over huge rocks, the mist from the falls increasing with every step. The vegetation changed considerably in the constantly damp environment. On the way back down for afternoon tea, we spent a while completely quiet. Listening to the sounds of the birds, the water, the horseflies buzzing; feeling the cool breeze on our skin and the damp leaves on the ground; surrounded by the sweet air and earthy fragrances so far removed from our usual lives. 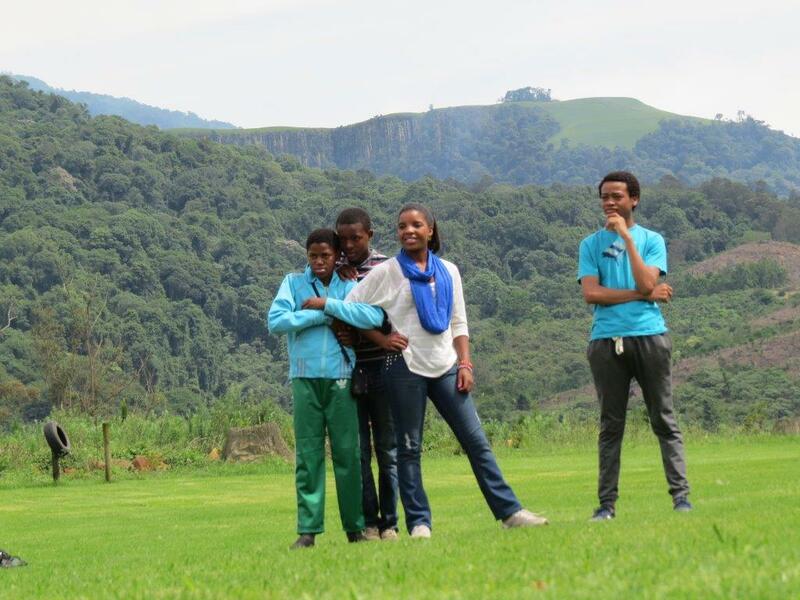 Asanda Ngubane loved the quiet time in the forest “It calmed me down and I felt so relaxed.” he commented. Free time to make new friends, play soccer and shower was a rowdy affair! The cosy dormitories are converted stables, a donkey boiler provides hot water and the views of the surrounding hills are stupendous. Sitting around the fire in the evening is ideal for imaginative storytelling. Altogether, this is a fabulous spot for a weekend in nature. The next morning, woken by birdsong, it was time to complete an obstacle course. 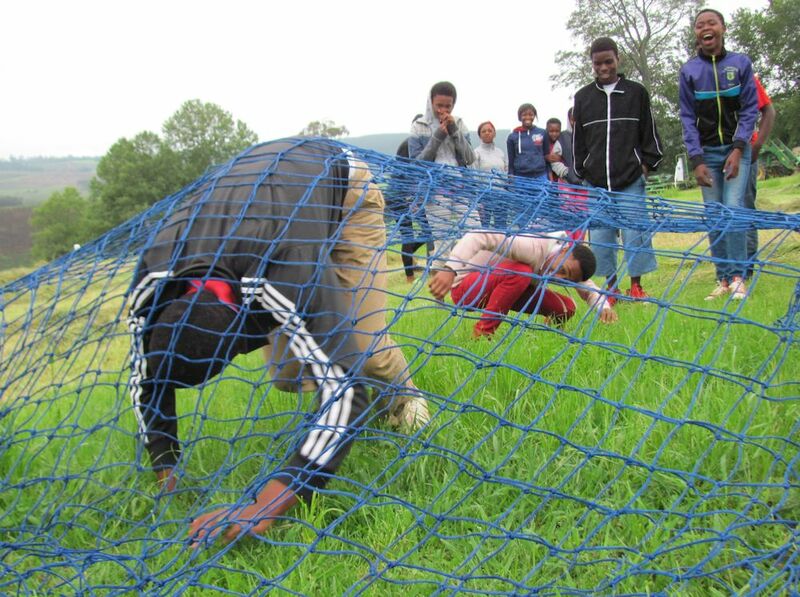 Sisanda Hadebe really enjoyed this “It was fun and we learnt to work as a team. I made some new friends too.” An inspiring creative activity using waste materials, and games, brought the weekend to a close. “That was amazing. I imagine I can still feel the drops of water from the waterfall on my face.” Nomfundo said afterwards. 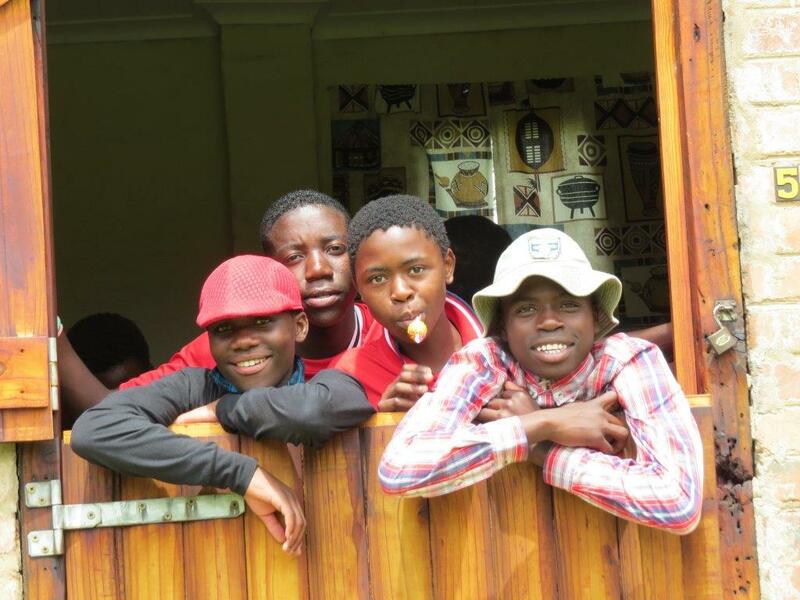 Many of the photographs included in this story were taken by the learners. 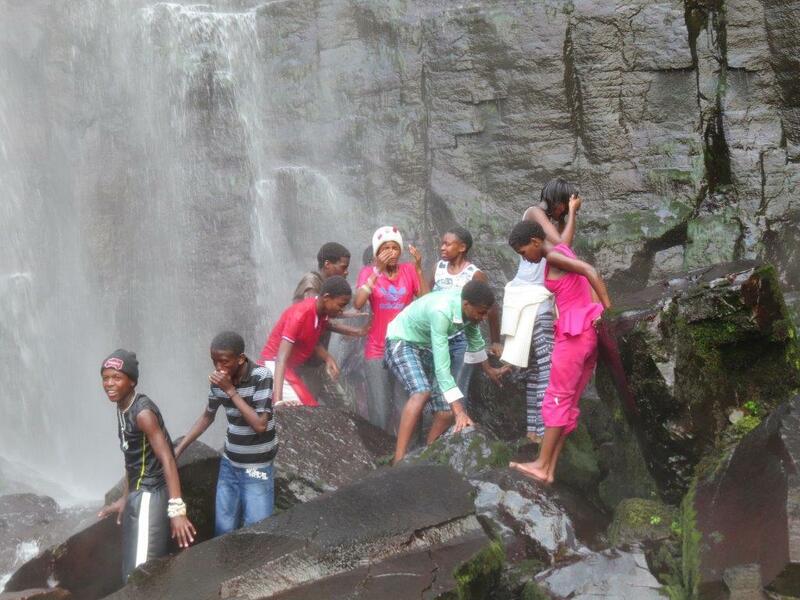 This entry was posted in Environmental Learning and tagged environmental learning, grey mares tail falls, karkloof, KZN Midlands, Mist belt forest, waterfall on December 17, 2014 by Midlands Conservancies Forum.